So you’ve completed your study and published your paper in the journal of your choice. Now you want to make your paper accessible to more and more readers within and outside the scientific community so as to increase its impact. 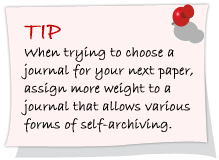 One way to increase the visibility of your paper is through self-archiving. Self-archiving is the practice of placing digital versions of scientific literature online. When you self-archive your research, you make it freely available to anyone on the Internet. In other words, self-archiving makes your research widely “visible, accessible, harvestable, searchable, and useable,”1 thus increasing its reach and impact, and possibly the number of citations it receives. Where does self-archiving fit in the publishing process? Institutional repositories: Many universities and research institutions own repositories where all their members can deposit their research papers. 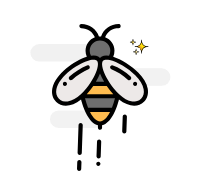 This enables researchers from that institution to view each other’s work and gives anyone interested a broad view of all work being conducted through that institution. Subject-based repositories: Some archives are subject-area specific and tend to be very popular in their respective disciplines, for example, PubMed for biomedical studies; RePEc for economics; and arXiv most popularly for physics, mathematics, and computer science. Personal servers or profile pages: Researchers can upload their work onto their own web pages. Further, some social networking sites for researchers, like ResearchGate , have sections dedicated to uploaded publications. 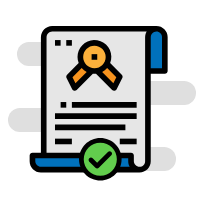 Self-archiving the pre-print version of your article does not infringe any copyright agreement since it is done prior to submission to the publisher. Hence, it is not a legal matter. Sometimes, though increasingly rarely, journals might disallow self-archiving pre-prints, which is a matter of journal policy and not copyright. There tend to be some discipline-based differences here, with self-archiving being a common and accepted practice in the physical sciences (physics, computer science, etc. ), but not so much so in the biomedical sciences. On the other hand, the copyrights of refereed post-prints usually belong to the journal, and self-archiving these can lead to a legal breach if the journal’s policy is not followed. 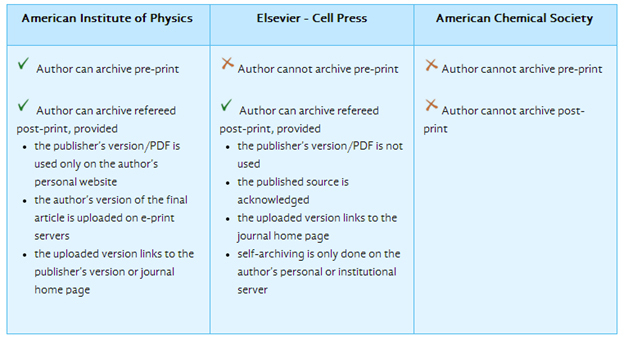 Journals/publishers have different copyright policies with regard to self-archiving post-prints. The table below shows the differing policies of some popular publishers with respect to self-archiving.7 Most publishers allow self-archiving of some sort, but remember to check your journal/publishers policy before self-archiving. Why is self-archiving not widely done? Lack of awareness of its benefits: A large proportion of authors are unaware of the option of self-archiving and its benefits. Therefore, even if the authors’ institutions have repositories, authors themselves don’t bother with self-archiving unless their institutions mandate it. Concern about the quality of self-archived articles: In some fields of study, such as computer science, pre-prints are archived much more than post-prints. Self-archiving pre-prints allows for research to be scrutinized by the larger scientific community before it goes through peer review. Further, in all archiving repositories, pre-prints are clearly marked as such. As for post-prints, their quality need not be questioned because they are merely a copy of the journal’s peer-reviewed published version. Fear of infringing the journal’s copyright policies: Most journals, in their instructions for authors, clearly state their copyright policies with regard to self-archiving. As long as you read and understand these policies, most of which allow authors to self-archive, you do not risk infringing any agreements. Perception that self-archiving is time consuming and cumbersome: Contrary to this belief, self-archiving takes only about 10 minutes9 for the first paper when you have to create a profile/account, and only a small percentage of people find it “very difficult.”8 For all subsequent papers, the process is even easier and faster. Fear of disrupting the current scholarly publishing model: Institutions may refrain from creating repositories for fear that such archives may be seen as a substitute for journals. However, in a previous study8, two major publishers in physics—the American Physical Society (APS) and the Institute of Physics Publishing Ltd. (IOPP)—confirmed that the physics pre-print server axXiv did not in any way threaten their own business models. Thus, publishers and self-archiving servers may well be able to coexist peacefully. Papers published in subscription journals are usually accessible only to researchers whose institutional libraries have subscriptions to those journals. Researchers affiliated to smaller institutions that cannot afford extensive journal subscriptions would not be able to access these papers. Moreover, the chances of such research reaching a wider audience of lay people and experts in unrelated fields are slim. Today, the world is increasingly moving toward a system where the intellectual output of the research community can be freely disseminated to the world at large. New journals adopting the gold route of open access, that is, with an article-processing charge for authors, are emerging, and even traditional publishers that work with a subscription fee-based model are offering more open access options. Funding bodies are encouraging scientists to embrace the concept of allowing free access to published literature. For example, Research Councils UK (RCUK) has recently announced a policy stating that from April 2013, all science papers that have received funding from grant agencies affiliated to RCUK must be made freely available within six months of publication.10 Public institutions like the US National Institutes of Health (NIH) mandate that all articles arising from NIH funds be archived in PubMed upon acceptance for publication. For a substantial number of journals, the NIH public access policy requires that the final published version of all NIH-funded research articles be made available on PubMed Central not later than 12 months after publication.11 Newer models of open access are also being explored. In sum, self-archiving is free, easy, and immensely beneficial. Moreover, it is in line with the noble evolving trend of free widespread dissemination of research findings for rapid global advancement of science. So go ahead and consider self-archiving a viable option to contribute to the progress of science and to increase your own research impact by making your work more accessible. Lawrence S (2001). Free online availability substantially increases a paper’s impact. Nature 411: 521. Pinfield S. Self-archiving publications. In: Gorman GE and Rowland F (ed.s). International Yearbook of Library and Information Management 2004-2005: Scholarly publishing in an electronic era. London: Facet, 2004, pp 118-145.
http://www.self-archiving.me/ Self Archiving: The Green Route to Open Access, powered by ResearchGATE.